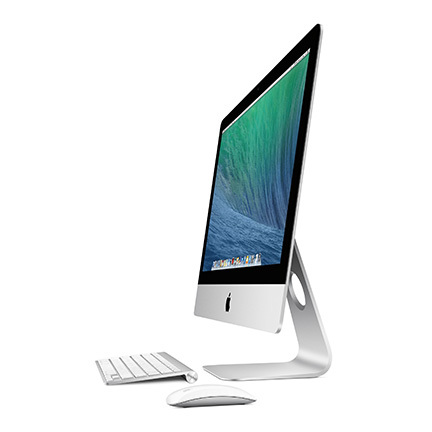 Apple introduced a new 21.5-inch iMac on Wednesday the company is calling its entry level model. Pricing starts at just over US$1,000, includes Intel's Core i5 processor, and the same design as its larger screen siblings. The new entry level model ships with a 1.4 GHz dual-core Intel Core i5 processor with 2.7 GHz Turbo Boost, Intel HD 5000 graphics, 8GB RAM, 500 GB hard drive, 802.11ac Wi-Fi, Bluetooth, dual Thunderbolt ports, four USB 3.0 ports, built-in FaceTime camera and stereo speakers, iLife and iWork, keyboard and Magic Mouse. Apple is charging US$1,099 for the entry level iMac. That's only $200 less than the 2.7 GHz quad-core Core i5 model with Intel Iris Pro Graphics and 1 TB hard drive, but the near $1,000 price point will be attractive to many buyers that would otherwise be on the fence about jumping into the Mac ecosystem. The 1.4 GHz dual-core iMac is available now and Apple's online store is showing 24 hour ship times.